I Went To NYC And This Is Where I Ate – Is It Vegan? Last week, I had the opportunity to hang out in New York City for the week. I was participating in a conference. Sadly, the conference had the worst food options. Luckily for me, I was in vegan heaven. 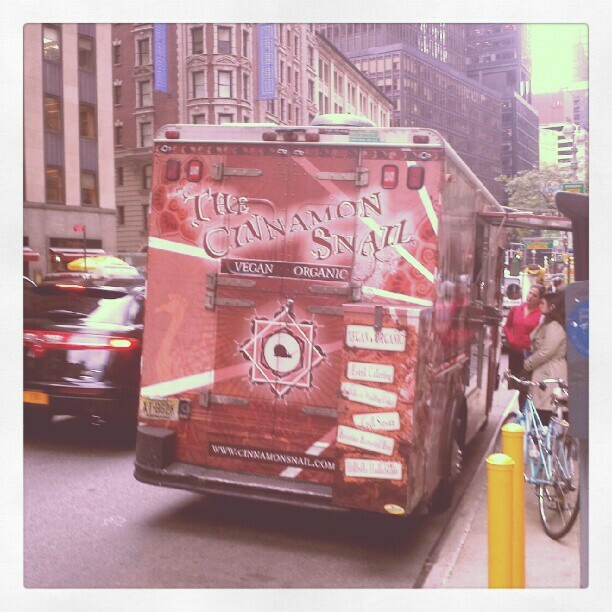 Nothing beats New York City for choices and options on every corner. A few people asked me where I ate so below is the breakdown. We arrived Monday afternoon and left Friday morning. That gave me 3 breakfasts, 3 lunches and 4 dinners worth of NYC goodness. It was pretty glorious. Plus, I had a few bucket list items to cross off. 3. Get some vegan treats. Red Bamboo – This is a staple NYC stop. I’ve been eating here for over a decade and lately have been branching out on my dinner choices. The soul chicken is amazing, but I wanted something different. Unfortunately, I got the seitan sandwich. It was good, but it wasn’t up to my usual expectations. Later, I would realize that Red Bamboo hadn’t failed me, but rather, every other vegan restaurant had stepped up their game. I could have got the same sandwich cheaper and better at my local spot, Veggie Galaxy. We decided to head over to Lula’s Sweet Apothecary for some delicious vegan ice cream. Again, unfortunately, it is closed on Mondays. D’oh! Luckily, they scoop this ice cream around the corner at Sustainable NYC. My buddy got an excellent americano too. Love those free trade beans! We were still hungry after our 80 block walk and hit up a Maoz Vegetarian in Times Square. It was definitely a great sandwich. Great pita, excellent hummus. I declared it a winner. We also happened to have a front row bench seat for either President Obama or President Clinton driving through Times Square. That was a circus worth watching. The previous night, I stocked up at the Whole Foods on Bowery. One of my favorite Whole Foods Markets around. Can’t believe it’s in the same neighborhood that CBGBs once was. Mind blowing to think that. Grabbed some juices and vegan scones. 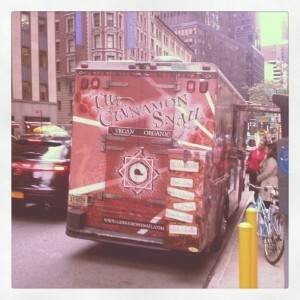 I saw that Cinnamon Snail Truck would be in midtown that day and forced my buddy to cab up Broadway for it. He was slightly skeptical, but the food made him a believer. The line was quick and the food was amazing. Great crew too. We joked about a customer who left before receiving her meal. Christine, are you out there?? I grabbed a slew of the tastiest donuts I have found on the east coast. Bucket list item #1, complete. We met up with some old friends at VP2. Loved meeting them there, loved enjoying VP2 with them. Sadly, I was again disappointed. VP2 is the that one restaurant that without fail, always makes top 10 lists. And for the last 10 years, it would make my top 10 list as well. This time around, it was just ok. I picked a menu item I’ve never got before and was disappointed to find I could have had the same meal less than 15 miles from my house. Te local meal would have been cheaper and would have provided me with enough for lunch the next day as well. Good for every vegan restaurant out there stepping up their game. Bad for VP2 sitting on their laurels. We tried to get coffee at Joe Coffee over on Waverly Place but they had just closed for the night. Bummer. A bagel and some tasty Grady’s Cold Brew iced coffee. Our buddy from Brooklyn delivered some to us. And yes, it is worth every penny. Big fan of iced brew coffee. The chicory is a nice addition too. It really mellows any acidity. I poured mine over ice and then splashed in some soy milk. Good stuff. Bucket list item #2 accomplished. We had planned on taking a few friends out to eat, but they had to cancel at the last minute. We had already planned on hitting up Blossom so we continued heading that way. It then started dumping buckets of rain so we had to take shelter under an awning or two. When we finally got to Blossom, we then had to wait in the rain because we forgot to make reservations. Whoops. Thankfully, our wait was short and the food was excellent. The staff was laid back and knowledgeable which helped too. I ordered the mini empanadas with awesome guac and the Smoked Hickorey BBQ Tempeh. Both were right up my alley. My buddy ordered and loved the crab cakes and the very popular mushroom tart. I definitely suggest this spot if you are looking for something upscale. We decided to bypass Maoz and check out Crisp. The line was long, and the food was more expensive than Maoz, but it was worth it. I accidentally ordered a salad instead of a sandwich. No issues here though, as it came with pita and some falafel on the side. Big fan. Super tasty hummus bowl. One more dinner with our friends. 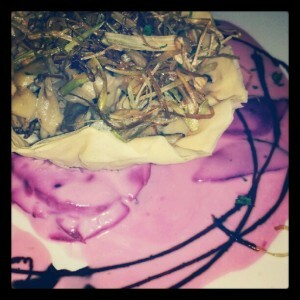 This time, we hit up Wild Ginger over on Broome St. We had some great asian vegan dishes, and plenty of laughs. Dessert was definitely the highlight.. My last bucket list item was “get vegan treats.” Later, it turned into “get Vegan Treats.” Luckily for me, Wild Ginger serves cake from Vegan Treats. 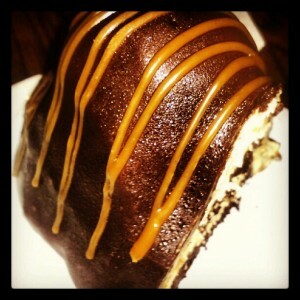 I went with the Chocolate Peanut Butter Bomb. It was ridiculously heavenly. My suggestion, hit up Vegan Treats and find your nearest reseller. Smart move. So that was the week. Courtesy of all the walking around, I didn’t even have to loosen my belt too much. Next time I’m in the city, I’ll probably try to hit up a whole different set of restaurants. Gotta keep it fresh, you know.